Have you ever heard of pink hot chocolate? Nor had we, until one of our in-house chocoholics dreamt up this fantasy concoction (perhaps on a high after one too many bowls of raspberry ripple ice cream). 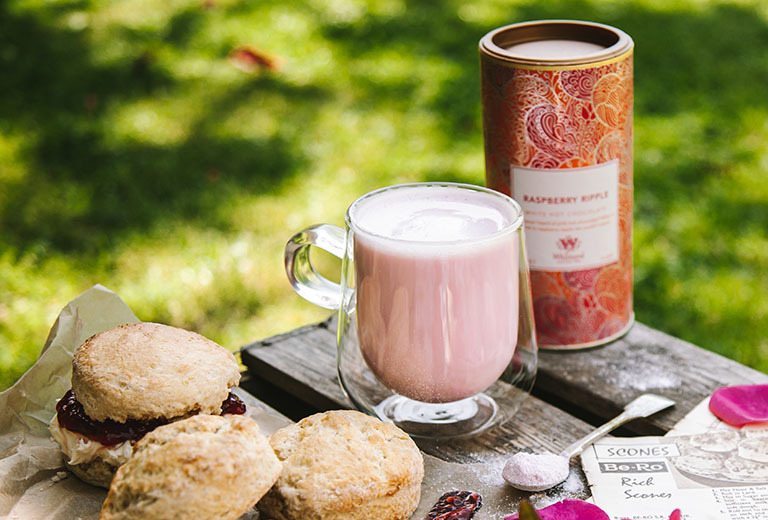 Combining our classic White Hot Chocolate with flavours of raspberry ripple, it's creamily sweet, velvety smooth and... pink. You'll have to see it for yourself. Sugar, Cocoa Butter (15%), Skimmed Milk Powder, Dextrose, Colour: Beetroot Red, Flavouring, Salt, Whey Powder (Milk), Stabiliser: E450. It's raspberry ripple ice-cream but as hot chocolate! A really nice hot chocolate drink! Smells and tastes of both white chocolate and raspberries which work very well together. Great smell of raspberries hits you when you open the tub.rnVery nice treat of white chocolate and raspberries, a really smooth, creamy and sweet taste that hits your taste buds. Sorry but it's too sweet for me. This hot chocolate is incredible. It tastes exactly like raspberry ripple ice cream but as a hot chocolate!rnAbsolutely worth a try, and I will definitely be purchasing this again before it's gone. Melt the chocolate in a glass bowl over a pan of barely simmering water (don’t boil the water or let it touch the bottom of the bowl). Alternatively, melt in a microwave-safe plastic bowl on medium power, stirring every 30 seconds until the chocolate is melted. Once melted, remove from the heat and stir in the hot chocolate powder until fully mixed. Add a few drops of the food colouring (depending on how pink you want your hearts). Pipe or spoon the mixture into a silicone heart chocolate mould and chill for at least an hour. When the chocolates have fully set, turn them out by gently pressing the underside of each mould to release them.